SANTIAGO, May 5 2014 (IPS) - Three private sector initiatives are aimed at carrying water from the rivers in southern Chile to the arid north of the country by ship or through underwater or underground pipelines. The objective is to slake the thirst of the mining industry of this country, the world’s largest producer of copper. The engineering works involved in the Aquatacama, Vía Hídrica del Norte and Sirius projects have passed the feasibility study stage. But they have not been approved by the authorities and environmental impact studies have not yet been carried out. The companies behind the projects are seeking clients, especially in the mining industry, and are lobbying the government for the initiatives to be declared of social interest. Their argument is compelling: the growing scarcity of water in the north, where the mining industry is concentrated, is limiting development and could give rise to social unrest. Mining is not an industry that can be ignored: it accounts for 13 percent of Chile’s GDP and 36 percent of national employment. This long, narrow South American country has abundant water resources, but they are distributed unequally. While to the south of Santiago average water availability is more than 10,000 cubic metres per person per year, to the north of the capital it is less than 800 cubic metres per person, according to a 2011 study by the World Bank. Copper mining alone consumes 12,615 litres per second of freshwater, according to the Mining Council. The three projects are presented as a solution to the gap between supply and demand, which will continue to grow. Aquatacama, a project of the French companies Vía Marina and Vinci, among others, spent 1.4 million dollars on a study that proposes transporting water from the mouth of the Rapel, Maule and Bío Bío rivers in south-central Chile to Arica, 2,500 km away in the extreme north, through a pipeline under the Pacific ocean. The route was analysed by navy and port authority technical experts. According to Aquatacama, the potential demand from the central city of Valparaíso to Arica (2,000 km apart) is between 30 and 100 cubic metres per second and distribution points could be installed every 100 km. The project initially proposes carrying water from Rapel to Coquimbo, some 400 km, to supply water distributors, the Andina mining company that belongs to the state-run copper mining Corporación del Cobre de Chile, and towns in the area. Energy consumption would be less than 0.9 kWh per cubic metre – four times less than the consumption involved in the desalination of saltwater, according to the companies behind the initiative. Vía Hídrica del Norte, of the Chilean-Spanish consortium Euro Engineering Group, would transport 25 cubic metres per second in underground steel pipes three to four metres in diameter, for a distance of 2,400 km. The goal is to supply the mining industry through a pipeline running from sea level to 4,300 metres altitude. The country’s main copper deposits are in the north, near the Atacama desert, the driest place on earth. The lack of water in that area also affects agriculture and human consumption. Water is distributed by tanker trucks and families who can afford it purchase bottled water for cooking and drinking. Sirius, a Chilean project, would complement other initiatives, and would require an initial investment of 50 to 60 million dollars. Its target is the area of Copiapó, 800 km north of Santiago, where two ships a month would carry up to 3.5 million cubic metres of water for human consumption. To that end, some 1,500 cubic metres per second would have to be extracted from a river in the southern region of Patagonia. 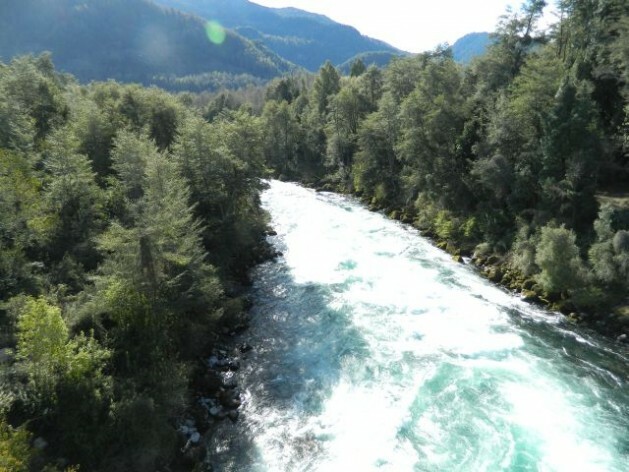 The company says less than 10 percent of the water in the river would be used, based on statistics from the Dirección Nacional de Aguas, the Chilean water authority. “The water deficit limits the prospects for development in the northern regions, which need to be supplied with products and services from other parts of the country,” Nicolás Jadue, the director of the Centro de Modelamiento de Negocios business modelling centre at the private Universidad Mayor, told Tierramérica. “Increasing supply would generate important benefits without a doubt,” he added. But these projects must be analysed “from the perspective of the social good,” he suggested. Jadue said that introducing water in the water-scarce north will fuel conflicts between the main sectors that compete for water – agriculture and mining. But the proposed solutions to address the scarcity sometimes clash. Cristian Silva, a mentor for the Sirius project, believes the scarcity reflects a lack of regulation. “The price of water has to be raised. The question is who will pay the cost,” he said. Some legislators propose renationalising water, which was privatised during the 1973-1990 dictatorship of General Augusto Pinochet, while social organisations are calling for demonstrations and mobilisations to demand a national water strategy. “Good use of water is better than dozens of local projects,” Axel Dourojeanni, a consultant to United Nations agencies and the former national director of the Peruvian government office on water and soil, said at the World Copper Conference held Apr. 7-9 in Santiago. “There are as of yet no studies of the necessary depth to determine the social, economic and environmental viability of transferring water from the south to the north,” Dourojeanni told Tierramérica. “And this option should not be studied separately from others, to improve efficiency, good use and land-use zoning. These are “false solutions that conceal the reality, mainly of the north, where the mining industry has been permitted to expand beyond all possible limits of tolerance of the ecosystems,” he told Tierramérica. Rodrigo Villablanca, the head of the Diaguita Community of the central Huasco Valley, which is fighting the approval of the Pascua Lama gold-mining project, told Tierramérica that “mining companies not only consume large quantities of water but also destroy glaciers in the upper altitudes of the basins even long before they start producing. “Now they want to take water from another ecological system that will also be damaged,” he said. Dourojeanni said “The most urgent thing is to improve water governance based on a comparison between the current and the hoped-for situation, which should be clearly outlined. “To do that, a strict protocol must be followed, like the one being developed by the OECD [Organisation for Economic Cooperation and Development], which is aimed at improving water management, free of ideologies or preconceived notions about privatising or nationalising,” said Dourojeanni. “Countries where everything has been nationalised suffer problems similar to those of Chile, so the issue goes beyond the question of nationalisation or privatisation,” he argued.